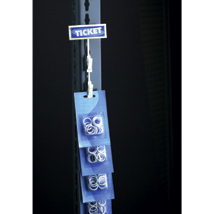 Clip display hangs easily on grid shelves and gondolas. Unique design allows you to clip merchandise on or simply hang merchandise over the clip. Strip features 12 clips with 2.5" between each clips. Includes a 2" x 1.5" label plate for pricing or product information.